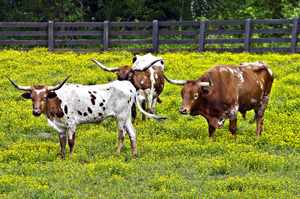 Paying a visit to most of Texas’ more than 100 historic dance halls typically requires a bit of navigational prowess: winding your way via two-lane highways or farm-to-market (FM) roads, often passing one-stoplight towns, BBQ stands and vast fields of wildflowers grazed by long-horned steer. The drive is scenic, for sure, but the best part of the experience comes later, when you find yourself standing inside one of these century-old “hardwood havens” with their boot-worn floors, hand-carved rafters, ancient wiring and chicken-wire windows. The effect is like instantly traveling back to a simpler time, a piece of history that is still very much alive. In 2008, several of these beloved halls found themselves at the top of Preservation Texas’ annual list of the most endangered historic places statewide. Advocates caution that the Texas dance-hall tradition could disappear altogether if there is no revival or rejuvenation for the buildings, many of which still have the original structures, wiring and plumbing. Another advocacy group, Texas Dance Hall Preservation, was founded in 2007 after Gruenau Hall in Dewitt County was destroyed in a fire. Built in 1900, it was one of the state’s rare round dance halls with maple hardwood floors. (Due to the dedicated efforts of its fans and local citizens, I’m happy to report that Gruenau Hall opened again in October 2010 with air-conditioning and new maple dance floor). Dance halls were often among the first public structures built in a town, the preservation group states, which estimates as many as 1200 were active in the early 20th century. Most have been lost and many of those still standing have been abandoned or converted for alternate uses, such as Saengerhalle in New Braunfels, which closed in July 2006 and is now used as a church. Whether playing Western swing to traditional country or Tejano music, today’s performers also play a key role in keeping the dance halls alive and thriving. 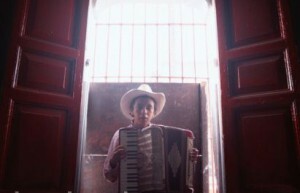 In return, the dance halls give Texan musicians a wide variety of venues to play live music. While working in Texas’ Hill Country for a few months, I tried to see as many of the historic dance halls as possible. 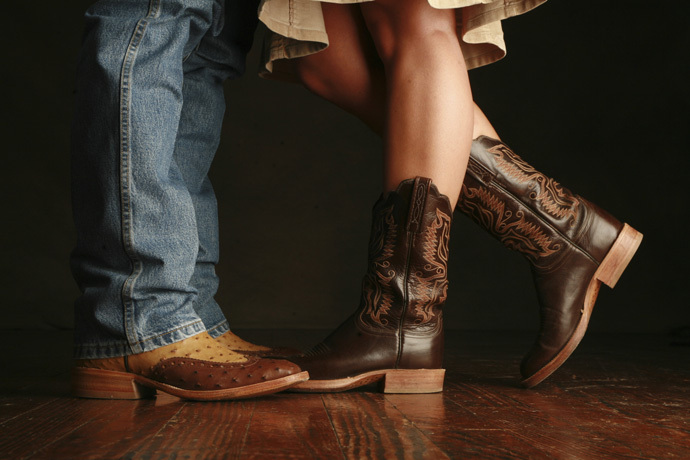 From the people of every age that would gather from miles around to dance the night away, to the local color and countryside, smoky BBQ, and extensive music history (still in the making), the dance halls easily became a favorite part of Texan life. As such, here are three of my favorites, plus another classic dance hall that has recently reopened. I hope they inspire you to pull on your best pair of cowboy boots and pay a visit, and help to ensure they’ll be around for future generations to enjoy. 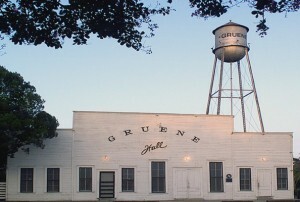 Gruene (pronounced “Green”) Hall was my first Texas dance hall experience, tucked into the sleepy town of New Braunfels, about 45 miles south of Austin. A potluck birthday party was underway in the front room around the potbelly stove, while a local band was tuning up to play on the main stage, so we took a seat at one of the well-worn picnic tables behind the dance floor to take in the show. The stage is decorated with original tin signs from companies like Blue’s Sugar Bowl and framed by a painted canvas backdrop. A rusty tin roof is the only existing cover for the aged wood rafters and dusty wiring. The tiny bathrooms serve as a changing area for artists and are still in the same location as they were 100 years ago. Strait later shot a Bud Light video on-site. Many recordings and movies have also used Gruene as the ultimate setting, including Pat Green’s Here We Go live album, as well as the movies Michael (starring John Travolta) and Flesh and Bone (with Dennis Quaid and Meg Ryan). What a great travel story! Texas dance halls are such a treasure. So glad they’re getting some well-deserved attention, so that folks will continue to visit them and keep them alive. There is an another amazing Dance hall in Houston named as Story Ultralounge. 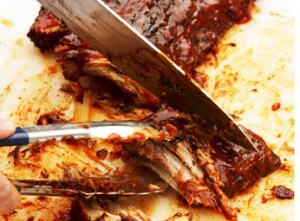 They also have Party halls to enjoy your special events like birthday with family. come and enjoy your night at story Ultralounge.